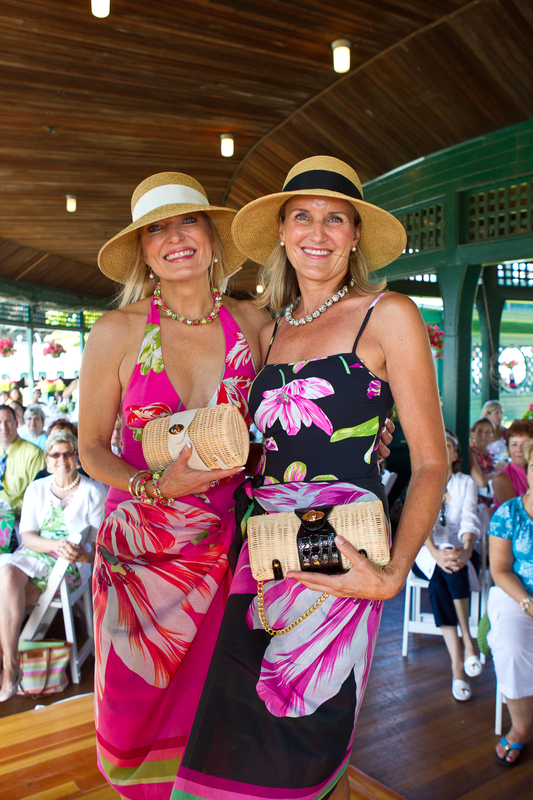 Both Susan Noel and Karen Megley of Newport are wearing Manuel Canovas swimsuits and sarongs, Toucan hats, Straw Studios bags and Angela Moore jewelry. 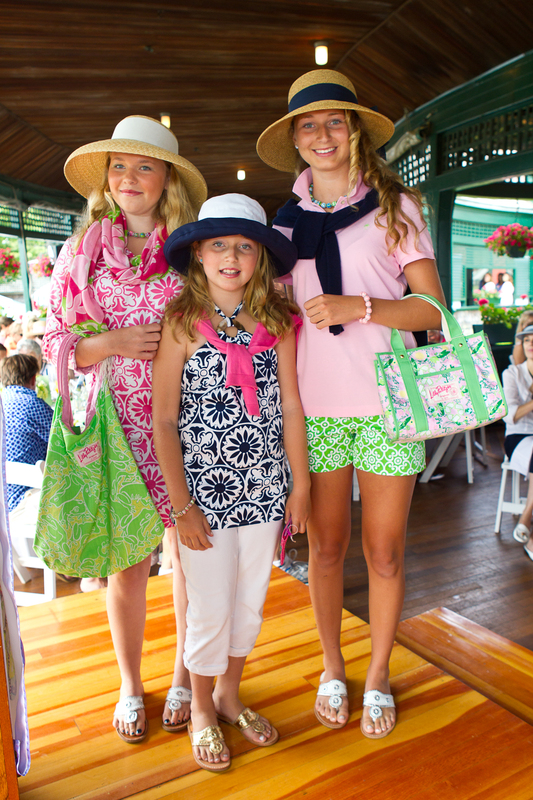 Ashley Bickford, Justin Goff and Carolyn Van Petten are wearing a mixture of Manuel Canovas, Lilly Pulitzer, Hat Attack and Angela Moore jewelry. 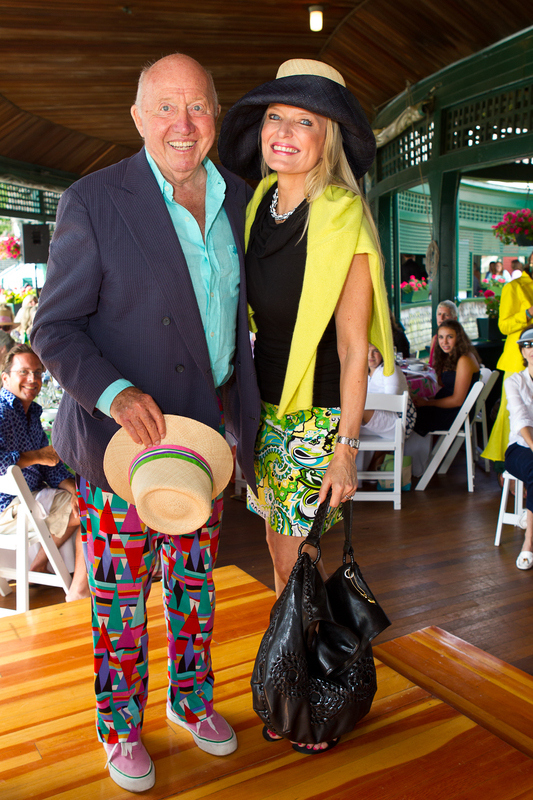 Tennis Hall of Famer Bud Collins wearing his own colorful and stylish attire with pants by tailor Charlie Anderson of The Andover Shop in Cambridge, MA, while Newporter Susan Noel is wearing a Melly M Pucci inspired print skirt, a Lilla P top, Big Buddha bag, Oniga hat and Angela Moore jewelry. The sold-out show on the historic Horseshoe Piazza grossed over $20,000 in proceeds that go towards maintaining and enhancing the International Tennis Hall of Fame, bringing the total raised through the Angela Moore Ladies’ Day events to over $220,000. Lucky guests also received raffle prizes from Fila, the Tennis Hall of Fame, Blackstone Caterers, Three Islands, and Celebeautique, Ki-Ra and Jo D’Alan salons. Kudos to all the behind the scenes players that made it happen! Entry filed under: Uncategorized. Tags: 190 Bellevue Avenue, Alashan, Angela Moore Fashion Show and Champagne Breakfast, Angela Moore Newport, Ashley Bickford, Big Buddha, Big Buddha bags, Blackstone Caterers, Bud Collins, Campbell’s Hall of Fame Tennis Tournament, Celebeautique Newport, Dustin Brown, Fila, Fornash scarves, Hat Attack, historic Horseshoe Piazza, International Tennis Hall of Fame Newport, Jack Rogers, Jo D’Alan Salon Middletown, Julie Brown, Kara Janx, Ki-Ra Salon Newport, Lilla P., Lilly Pulitzer Newport, MA, Madagascar hats, Manuel Canovas, Melly M, Miss Connecticut, Moyna Bags, NBC10. Frank Carpano, Oniga, Oniga hat, Pucci, Ryan Harrison, Straw Studios, The Andover Shop Cambridge, The International Tennis Hall of Fame, The Water’s Edge Newport, Three Islands, Tomasz Bednarek, Toucan hats. Open for Business: Artist’s Gallery, Nautical Outfitters, Jewelry and an All American Ice Cream Shop	Konnichiwa, Black Ships Festival! what a fabulous show I was honored to do the makeup! Newport is so lucky to have Angela Moore doing this event, cannot wait till next years huge event! The gals looked great- and I loved how their hair changed in each set to complement their attire. Nice work! This event was wonderful ! All the Models were fabulous …. Looking forward to next years BIG event !